Leaping lizards have a message for robots: Get a tail! University of California, Berkeley, biologists and engineers ‑ including undergraduate and graduate students ‑ studied how lizards manage to leap successfully even when they slip and stumble. They found that lizards swing their tails upward to prevent them from pitching head-over-heels into a rock. But after the team added a tail to a robotic car named Tailbot, they discovered that counteracting the effect of a slip is not as simple as throwing your tail in the air. Instead, robots and lizards must actively adjust the angle of their tails just right to remain upright. UC Berkeley professor Robert Full discusses his research on lizards and geckos and how the biomechanical principles he and his students discovered apply to the design of robots. Courtesy of Nature & CiBER/UC Berkeley. Agile therapod dinosaurs like the velociraptor depicted in the movie Jurassic Park may also have used their tails as stabilizers to prevent forward pitch, Full said. Their tail movement is illustrated in a prescient chase sequence from the 1993 movie in which the animated animal leaps from a balcony onto a T. rex skeleton. Full and his laboratory colleagues, including both engineering and biology students, will report their discoveries online on Jan. 5 in advance of publication in the Jan. 12 print edition of the journal Nature. The paper’s first author, mechanical engineering graduate student Thomas Libby, also will report the results on Jan. 7 at the annual meeting of the Society for Integrative and Comparative Biology in Charleston, S.C.
Full is enthusiastic about the interplay fostered at UC Berkeley between biologists and engineers in the Center for Interdisciplinary Bio-inspiration in Education and Research (CiBER) lab, within which he offers a research-based teaching lab that provides dozens of undergraduate students with an opportunity to conduct cutting-edge research in teams with graduate students. Each team experiences the benefits of how biologists and engineers approach a problem. Full’s research over the past 20 years has revealed how the toe hairs of geckos assist them in climbing smooth vertical surfaces and, more recently, how their tails help to keep them from falling when they slip and to right themselves in mid-air. The new research tested a 40-year-old hypothesis that the two-legged theropod dinosaurs ‑ the ancestors of birds ‑ used their tails as stabilizers while running or dodging obstacles or predators. In Full’s teaching laboratory, students noticed a lizard’s recovery after slipping during a leap and thought a study of stumbling would be a perfect way to test the value of a tail. 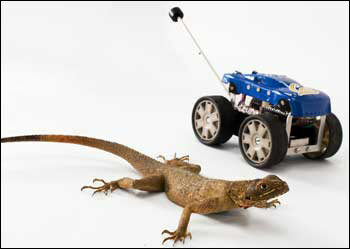 An Agama lizard next to Tailbot, a toy car with an attached tail. Sensors detect Tailbot’s orientation and swing the tail upward to keep the robot from pitching forward, similar to the way the lizard uses its tail. Photo by Robert Full lab, UC Berkeley. 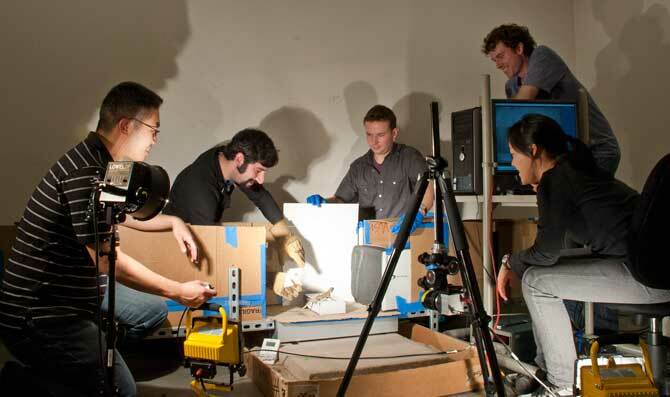 In the CiBER lab, Full and six of his students used high-speed videography and motion capture to record how a red-headed African Agama lizard handled leaps from a platform with different degrees of traction, from slippery to easily-gripped. They coaxed the lizards to run down a track, vault off a low platform and land on a vertical surface with a shelter on top. When the friction on the platform was reduced, lizards slipped, causing their bodies to potentially spin out of control. When the researchers saw how the lizard used its tail to counteract the spin, they created a mathematical model as well as Tailbot – a toy car equipped with a tail and small gyroscope to sense body position ‑ to better understand the animal’s skills. With a tail but no feedback from sensors about body position, Tailbot took a nose dive when driven off a ramp, mimicking a lizard’s take-off. When body position was sensed and fed back to the tail motor, however, Tailbot was able to stabilize its body in midair. The actively controlled tail effectively redirected the angular momentum of the body into the tail’s swing, as happens with leaping lizards, Full said. Tailbot’s design pushed the boundaries of control in robotics in an area researchers call inertial assisted robotics, an attention-grabber at last October’s meeting of the International Conference on Intelligent Robots and Systems. The UC Berkeley researchers’ paper, presented by Libby and fellow mechanical engineering graduate student Evan Chang-Siu, was one of five finalists there among more than 2,000 robot studies. Full and his students are now investigating the role of the tail in controlling pitch, roll and yaw while running. UC Berkeley coauthors include Full and students Moore, Libby and Chang-Siu, along with Department of Integrative Biology undergraduate Deborah Li and graduate students Ardian Jusufi in the Department of Integrative Biology and Daniel Cohen in the Department of Bioengineering. Chang-Siu works with Masayoshi Tomizuka, professor of mechanical engineering, in UC Berkeley’s Mechanical Systems Control Laboratory. The work was funded by the National Science Foundation, including the NSF’s Integrative Graduate Education and Research Traineeship (IGERT) program, and the Micro Autonomous Systems Technologies (MAST) consortium, a large group of researchers funded in part by the U.S. Army Research Laboratory that is focused on creating autonomous sensing robots. Students in the Mechanics of Organisms research-based teaching laboratory measure the leaping prowess of an Agama lizard. Left to right, Evan Chang-Siu, Daniel Cohen, Ardian Jusufi, Thomas Libby and Deborah Li. Courtesy of PolyPEDAL Lab & CiBER/UC Berkeley.